A premium dark chocolate bar of Valrhona Grand Cru quality. Made exclusively from the Trinitario bean from the Caribbean islands. 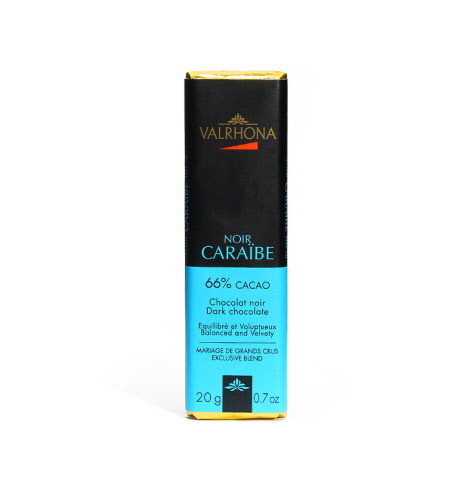 Caraibe has a 66% cocoa content providing a moderate dark chocolate bar with not too much bitterness and a smooth melt. It's gentle and fruity, revealing delicate flavours of almond and roasted coffee. A premium dark chocolate bar of Valrhona Grand Cru quality. Made exclusively from the Trinitario bean from the Caribbean islands. Caraibe has a 66% cocoa content providing a moderate dark chocolate bar with not too much bitterness and a smooth melt. Powered by ShopFactory to sell P1108 online. All-in one eCommerce and online shopping cart software.